merry christmas to the good spoon! Benjamin and I arrived in Aiken, SC late wednesday night and dove into a wonderful meal of red beans and rice thanks to Garden & Gun magazine. Not kidding with the title there. 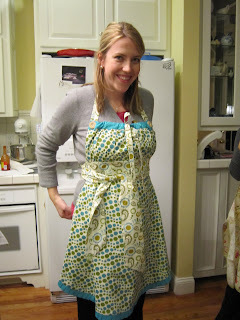 I was going to post this tomorrow, but I'm just too excited about how cute these aprons are! His mom made them for me and each says, "the good spoon" on them. so so so cute! I love them. She also got me some other fun entertaining items and ...drumroll... the Pioneer Woman cookbook signed by her to me!! She talked about the good spoon and good life and cooking for my "MM"- Montana Man. Love! I'm excited to try out one of her recipes soon! Those aprons are so adorable and amazing! And I can't believe you got an autographed copy of The Pioneer Woman Cooks! Those aprons are darling! Love them. Such a sweet present. Calling all apron lovers. 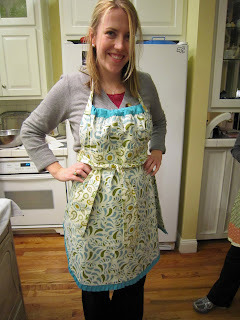 This is the daughter of the very talented apron maker. Just wanted to put this out there. 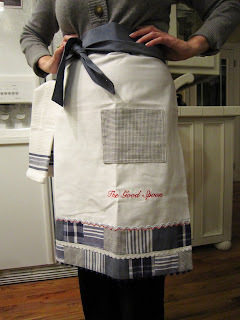 My mother would love to make these Good Spoon Aprons to sell!!! If you are interested here is my mother’s email. Just wanted to say to all of Laura’s friends, you are all so blessed to have such a sweet girl in your life. I have very much enjoyed getting to know this wonderful girl! 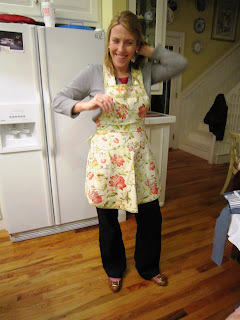 Laura, you look so cute in your new aprons!